We offer yet another way to handle Kratom via our pre-measured Maeng da Kratom capsules in convenient 100 and 250 capsule packages. Currently, we offer Maeng da capsules with a lab-verified alkaloid content of 1.8%. Soon we'll offer our most mature leaf and Top Seller; Red Thai, also with a lab-verified alkaloid content of 1.8% as well. We only take the most mature and alkaloid-rich source material for making these capsules. Please note: Although these capsules are manufactured in a GMP facility and made to food grade standards, this product is not intended for consumption. We simply offer this product in capsules to make it easy to measure out specific amounts of product without the need of a precise scale. Maeng Da is not a unique strain of Kratom Leaf that has established itself as a Top Seller across the globe. What Maeng da refers to is alkaloid content of the Kratom leaf. So, Maeng da leaf can be from Bali, or anywhere else in the world. It's simply the best and most mature leaves when the harvest is taking place. Expert harvesters can intuitively tell which leaves will have the strongest alkaloid content simply by looking at the color and quality of the Kratom leaf. These Maeng da capsules are often in short supply, and increasingly high in demand. Maeng Da has more energizing characteristics, making it a highly sought-after, prized leaf. 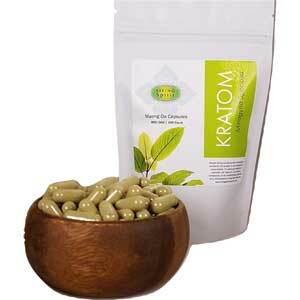 This special strain of Kratom is also available as an extract. All of our Kratom is verified authentic by Columbia or Wonderland-Labs, and we only choose the highest quality Kratom leaf and powder from verified sources. Nearly 2 decades in business, we have a wide variety of sources, and only the best sources make it through our strict screening process. Why trust Maeng Da Capsules from anywhere else? PLEASE NOTE: Although these capsules are manufactured in a GMP facility and made to food grade standards, this product is not intended for consumption. We simply offer this product in capsules to make it easy to measure out specific amounts of product without the need of a precise scale. We offer it for external use only, for legitimate research purposes, as an herbarium specimen, an incense component, or for aromatherapy purposes only.